6) Note that the header area of the single event (the area with the title of the event) does not display the time on the right-hand side. 9) Note the existence of the start time in the right-hand side of the header section for the single event. 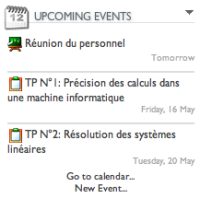 1) Login with permissions to create an event 2) Add a new event to the calendar with a start time greater than your current datetime 3) Ensure that the option of no duration is selected 4) Create the event 5) Click the date of the event you created in the mini calendar to arrive at the daily agenda view for the calendar 6) Note that the header area of the single event (the area with the title of the event) does not display the time on the right-hand side. 7) Apply patch 8) Repeat steps 1-5 9) Note the existence of the start time in the right-hand side of the header section for the single event. When a calendar event is set as having no duration, the start time is not displayed on the day view.